Embattled White House hopeful Herman Cain effectively ended his presidential bid Saturday after support dried up in the wake of accusations from a string of women that he had engaged in sexual impropriety. Cain said he was technically "suspending" the campaign and vowed to press on with his unique blend of conservatism through a new website, thecainsolution.com. "I am not going to be silenced and I am not going away," he said with his wife Gloria at his side, vowing to continue to be "a voice for the people." "As of today, with a lot of prayer and soul searching, I am suspending my presidential campaign," Cain said at a rally that was originally planned to be the grand opening of his national campaign headquarters in Atlanta. "I am suspending my presidential campaign because of the continued distraction, the continued hurt caused on me and my family. Not because we are not fighters," he said. The "suspension" allows his campaign apparatus to continue to raise funds. The move intensifies the two man race between current frontrunners Mitt Romney and Newt Gingrich, the former Massachusetts governor and House speaker, respectively. Cain's so-called "Plan B" comes less than a week after a woman he characterized as a friend said she and the Georgia businessman had been carrying on a sexual affairfor more than a decade. Ginger White said it was not a love affair, but Cain showered her with gifts and offered financial assistance for her monthly living expenses. Cain called the relationship a friendship as he acknowledged that his wife of more than four decades had no knowledge of White prior to Monday. Cain thanked his supporters for their support as he blamed the media for forcing his hand. "I am disappointed that it came to this point, that we had to make this decision," Cain said. "These false and untrue allegations continue to be spinned in the media, and in the court of public opinion so as to create a cloud of doubt over me and this campaign and my family. That spin hurts. It hurts my wife. It hurts my family. It hurts me. And it hurts the American people, because you are being denied solutions to our problems," Cain said. Cain was already under pressure after revelations several other women had accused him of sexual harassment and inappropriate sexual advances in the 1990s while he was the head of the National Restaurant Association. Cain has acknowledged that financial contributions fell sharply after news of the long-term affair broke and several high-profile supporters, including two key New Hampshire backers, have defected to back former House Speaker Newt Gingrich. Just eight percent of likely Republican voters at the Jan. 3 Iowa caucuses support Cain, according to a poll released Friday by the Des Moines Register. That is about a third of the 23 percent support Cain had just over a month ago. The former CEO of Godfather's Pizza began his campaign in relative obscurity in May. He shot to the top of the polls in September on the strength of his personal charisma and the unexpected popularity among conservatives for his signature 9-9-9 tax plan to eliminate the current tax code in favor of a nine percent income tax, a nine percent corporate tax and nine percent sales tax. Cain said he was "at peace" with his decision. "So one of declarations I want to make to you today is that I am at peace with my God. I am at peace with my wife, and she is at peace with me. And I am at peace with my family and at peace with myself," Cain said. Despite being forced out of the race amid accusations of unseemly and inappropriate sexual behavior, his White House bid and surprising rise in the polls have likely boosted his earning power. Cain called at least some of Republican rivals ahead of his rally. His former rivals were flattering in their public statements about Cain as the race for his endorsement begins. Romney said he wishes Cain well and Gingrich, who many observers expect to benefit most from Cain's exit, praised the unconventional candidate for raising bold ideas and promoting them effectively. "Herman Cain's 9-9-9 plan got our country talking about the critical issue of how to reform our tax code and he elevated the dialogue of the Republican presidential primary in the process," Gingrich said in a written statement after Cain made his decision official. 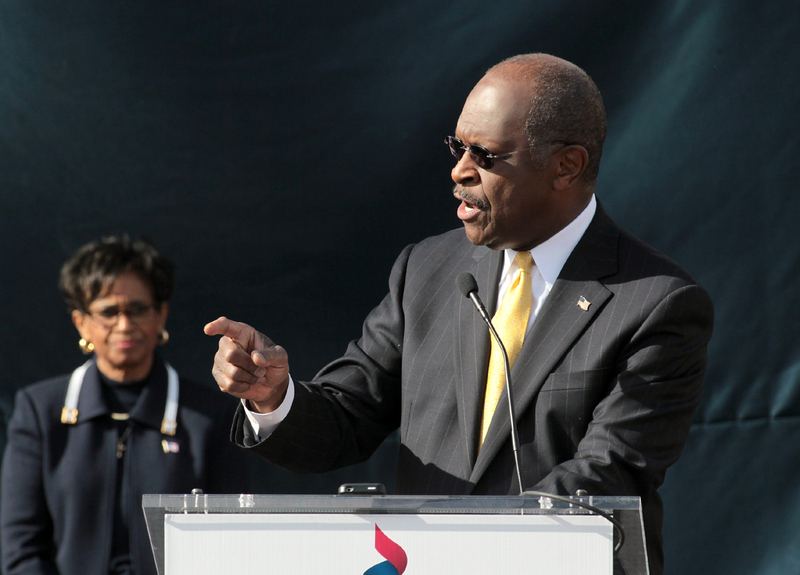 "I am proud to know Herman Cain and consider him a friend. I know from having worked with him for more than a decade he will continue to be a powerful voice in the conservative movement for years to come," the former Georgia lawmaker said.